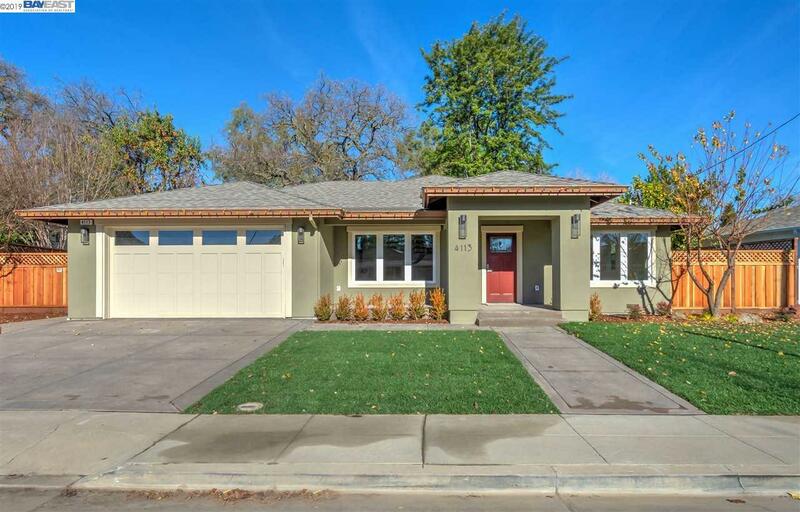 Rare 1-Story New Construction/Complete Remodel on Downtown Pleasanton's Candy Cane Lane! Private Court Location Backs To Creek With Peaceful Views. Beautiful Design & High Quality Finishes Throughout. Great Room Floor-Plan with Spacious & Open Island kitchen featuring SS Appliances, Quartz Counters & more. Luxury Vinyl Plank Water-Resistant Flooring Throughout & Quality Carpet/8 lb. Pad in bedrooms. Master Suite with Walk-In Closet, Dual Sinks & 2nd Private Access to Rear Yard. Built-in Speakers in 3 main rooms + back patio. Gorgeous tile baths, Built-In Speakers in Multiple Rooms & Backyard & Laundry Room w/ Storage. Tankless Water Heater, High-Efficiency Heat/Air & LED Lighting, All-New Plumbing/Electrical, Windows, Cool Roof Asphalt Shingles, New Redwood Fences, New Patios, Driveway & Garage slab. New Landscaping & Sprinkler System. Back Patio w/ gas-line is also pre-wired for hot tub. Enjoy the Covered Front Porch. One block to Main Street. Walk or bike to all 3 levels of schools.